The Basics: The Butler is a sweeping portrait of the civil rights movement in America, told through the eyes of Cecil Gaines, who served as a butler in the White House from Eisenhower to Reagan. While the film highlights important moments in American history from inside the White House, the true heart of this film lies in Cecil’s house, where he struggles with an alcoholic but loving wife, a son in Vietnam, and another son making his voice heard as a Freedom Rider and later as a member of the Black Panther Party. This film takes the fight for equal rights—from a sharecropping field in the 1920s to the election of President Obama—and makes it intensely personal. This is a story that needs to be told, and its told through some truly fantastic performances. Yes, some of the presidential stunt casting was unbelievable to the point of taking away from the film, but, ultimately, what really mattered where the performances given by Whitaker, Winfrey, and Oyelowo. This trio of actors anchored the film with performances that were nuanced, powerful, and completely compelling. M.V.P. (Most Valuable Performer): Without a strong actor taking on the role of Cecil, this film could have felt like a dry history lesson, jumping from one milestone to the next without any real emotional connection. Thankfully, Forest Whitaker gives his performance the quiet strength that we’ve come to expect from such a brilliant actor. Cecil never feels like a caricature or anything less than a real, three-dimensional person. We can feel the toll that years of hard work and suffering have taken on this man, but we can also feel the pride he takes in his job and the life he was able to build for his family. There is a quiet dignity to Whitaker’s performance that could get lost among the more flashy performances to come as “Oscar season” approaches. But his work should not be forgotten or lost in the shuffle because he is able to make you believe in this man and in the values by which he lives his life. It’s a testament to Whitaker’s performance that I found myself crying by the end of the film because I felt like I could understand what the election of President Obama would mean to Cecil Gaines. That ability to make the audience connect so strongly with a character in just a couple of hours is something only the best actors possess. Scene Stealer: David Oyelowo might be a relative unknown (to me at least), but I walked away from this film incredibly impressed with him. There was such passion in his performance, and that uncontrolled fire of purpose worked so well opposite Whitaker’s more quietly powerful Cecil. The generation gap between Louis and Cecil is a driving force in this film, and it works because you are able to understand both sides of that gap. Whitaker makes you believe in Cecil’s reasons for acting the way he does (the murder of his father being the horrible foundation for his views on acting out too strongly), but Oyelowo also makes you understand Louis’s need to take action and to fight. He’s not just some rebellious kid; he’s someone who wants a better life for his future family the same way Cecil did. He doesn’t hate his father; he just doesn’t understand him. And that kind of universal struggle between generations takes on such a unique life in this film, a life that rings with authenticity because of the honesty Oyelowo gives to Louis’s journey. Bring the Tissues? If you remain unmoved while watching Cecil react to the 2008 Election Night results, then I’m not sure you were really watching the movie. I was on the verge of tears a few times throughout the film, but that moment is what made me actually start crying because I could feel how much it meant to these characters, especially Cecil. Most Memorable Scene: The generation gap that fuels the tension throughout the film comes to a powerful head in a dinner table confrontation between Cecil, Louis, Gloria, and Louis’s girlfriend. With Louis in his Black Panther clothing and his girlfriend sporting a huge afro while sitting with the modestly dressed Cecil and Gloria, the contrast is evident before any of the characters even begin speaking. And when they do begin speaking, it erupts into the best scene in the film. A discussion about Sidney Poitier turns from small-talk to fighting words when Louis scoffs at men like him and, by extension, his father. Louis’s inability to understand the pride his father takes in his job finally proves too much for the usually stoic Cecil, who explodes with a force we only see once in the film—but it’s enough. But the true “scene stealing” moment belongs to Oprah. I know it’s been shown in every commercial and trailer for the film, but the moment when she slaps her son and tells him that everything he is and has is because of “that butler,” I still got chills like I was hearing it for the first time. And I wanted to cheer when she kicked his horrible girlfriend out of her house. I was worried going into the film that Oprah wouldn’t be able to disappear into this role as much as she would need to, but this scene was the moment when I knew my concerns were unfounded. Strengths: As I mentioned earlier, this is a story that needs to be told. It’s a story about a part of American history that we don’t want to look at sometimes because it’s ugly, and it makes us uncomfortable to be reminded that it wasn’t that far in the past. This film doesn’t gloss over the horrors of the civil rights movement (the bombings of buses, lynching of young men, and humiliation endured at sit-ins are shown unflinchingly), and, in doing so, it makes the “feel good” ending ring true, honest, and earned. It also does a wonderful job of never depicting either Cecil or Louis as the right one or the wrong one in the debate over how to approach the fight for civil rights. Cecil is a fighter in his own way, standing up for equal pay for the black members of the White House staff. There are so many different ways to be strong and show strength, and I applaud this film for celebrating the quiet strength and dignity of a man like Cecil as well as the work of civil rights crusaders like Louis. I approached this film somewhat skeptically because of its cast, but I walked away from it incredibly impressed by almost all of them. I was worried that the presence of so many familiar stars would detract from the film, but most of these actors actually drew me deeper into the story. I’ve already mentioned the talents of Whitaker, Winfrey, and Oyelowo, but I have to take a moment to single out some other great performances. Cuba Gooding Jr. and Lenny Kravitz were both excellent as fellow White House staff members. Also, Jane Fonda made one heck of a Nancy Reagan. And finally, it may just be my bias towards both the Kennedy family and James Marsden showing itself, but I thought Marsden’s JFK was the best of the presidents we saw in the film. He had the accent and the handsome charm, but there was also a softness and inherent kindness to his performance that really resonated with me in the few moments he was onscreen. Weaknesses: There were times when the “Forrest Gump-ness” of the film seemed to be a little much (like Louis hanging out with Martin Luther King Jr.). I understand wanting to tie in all of the major moments from the civil rights movement, but sometimes it felt too contrived to have these characters be in the middle of so much. The other part of the film that felt a little over the top was the casting for some of the presidents. I can see wanting to have some big names in these roles, but dressing up Robin Williams like Eisenhower won’t make me actually believe he’s Eisenhower. And putting a lot of makeup on Alan Rickman’s face still won’t stop me from seeing Professor Snape first and Ronald Reagan second. A lot of the presidential performances felt more like caricatures than real attempts to capture the spirit of these men, and it took me out of the film at some points. 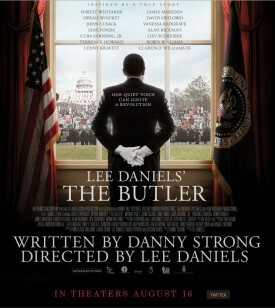 Final Verdict: Despite some very strange stunt casting and a plot that might resemble Forrest Gump just a shade too closely, The Butler is a film that’s easy to get invested in. It takes a period of huge change and makes it feel personal in a way no other film ever has before. Thanks to some brilliant acting from its main cast, this film not only makes you think; it makes you feel. It shocks you, it moves you, and, by the end, it fills you with so much hope for the future of America because it shows you how far we’ve come in such a short period of time. This entry was posted in Film, Nerdy Girl Goes to the Movies and tagged film, genre: drama, movie reviews, oscar contenders by Katie. Bookmark the permalink.